If I don’t believe in the “supernatural”, why is coming to church important? As a part of the learning in the confirmation program, we ask students to fill out “worship notes”. They don’t have to outline the “three points of the sermon” but they are encouraged to be creative. Sometimes they draw their impressions with some pretty cool artwork and often they ask great questions about what they saw or heard or experienced. Each week, I get the privilege of reading through and responding to some of the worship notes and it’s one of the best parts of my week. I learn from these students as much as they (hopefully) learn from me. Several weeks ago, the question at the top of this page was asked by a student and it really got me thinking. How do people understand Christianity or the reason for belonging to a church? What are we communicating about the nature of what we believe? And such questioning was made all the more interesting because of a book I read during the long plane trip to Tanzania titled How God Became King by N.T. Wright. Wright makes the bold claim that Christianity has for too long focused on too narrow a view of Jesus and what it means to “believe in him” perhaps even to the extent that we have missed the main point of the gospels. Things like creeds and dogmas, as important as they are, tend to over-intellectualize faith, making the words we speak about Jesus more important than the words Jesus actually spoke. On the other hand, faith can be so over-spiritualized that it becomes a ticket we punch in order to get into heaven. Faith becomes so “super-natural” (above and beyond our experience) that it fails to connect to everyday life and causes some people to falsely pit faith against science, as if one can only be true at the expense of the other. “In Jesus, God comes to rule the earth as king” says Wright. Jesus is not simply the way to get to heaven. Jesus is heaven coming to earth in order that we might walk in the way of Jesus in our everyday experiences. The prayer Jesus taught us to pray is for the kingdom to come ON EARTH as it is in heaven. Jesus brings the love of God to a world that doesn’t love so well. It is the power of dignity, forgiveness, healing, hope, peace, and justice in a world that is divided by race, class, politics, geography, and selfishness. Jesus crosses borders, heals the sick, humbles the arrogant, touches the outcast and proves with his very life, that violence is not the answer because the power to give LIFE will always win out over the power to take it. 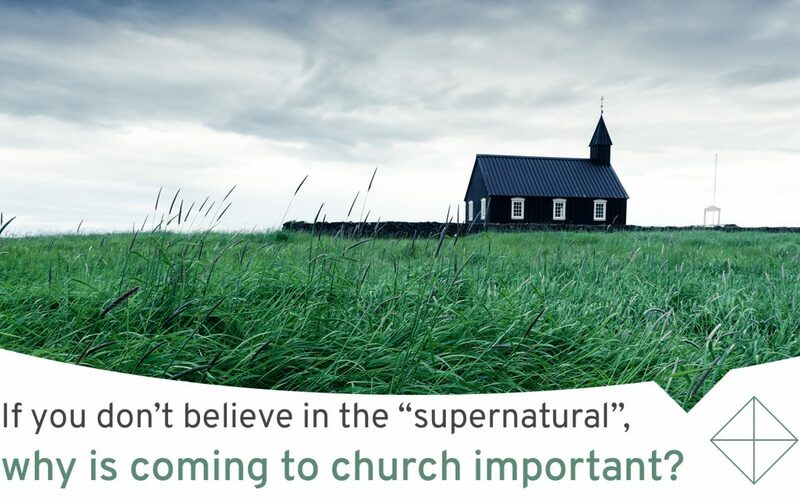 The church then, is a location where both the “super” and the “natural” meet. It is where we come to hear about an “alien righteousness”, the truly super and amazing grace God shows to the world in the person of Jesus. But it is also the place where we learn to live more righteously in the natural world, to follow Jesus and obey his commandment to love one another in our everyday lives. Our work, our school, our attitudes, our politics, our relationship to the earth and the way we value other people all take on the character of God’s love. That’s supernatural! It’s not magic but it is amazing. It’s not perfect, but it is filled with purpose. That’s the good news we live and the good news we share. That’s the body we are members of; the church of Jesus Christ. • Saturdays at 5:30 p.m.
• Sundays at 8:15 a.m. and 10:45 a.m.